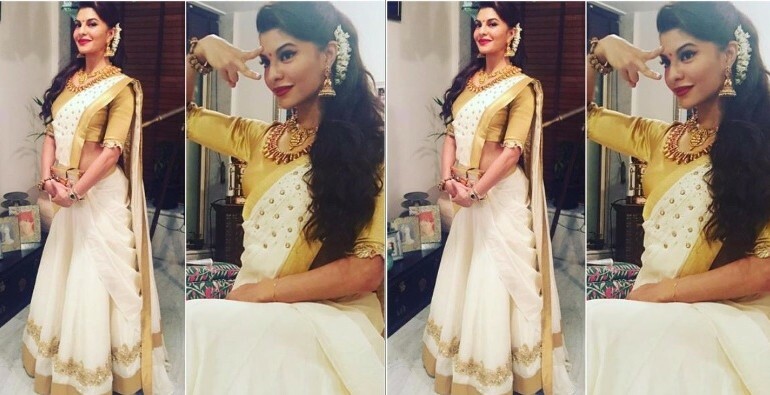 In this post we will show you bollywood actress Jacqueline Fernandez saree wardrobe. Bollywood Actress Jacqueline Fernandez Loves to wear sarees in movies, awards, parties and friends wedding functions. Many times Jacqueline Fernandez fans have spoted her in beautiful sarees. Jacqueline Fernandez is spoted in red sarees, blue sarees, black sarees, green sarees, yellow, orange, white and more colors. Jacqueline Fernandez designer uses georgette, net and silk fabric to create awesome saree for her. Jacqueline Fernandez saree is of famous designers like Shehlaa, Manish Malhotra, Anamika Khanna, Archana Rao, Poornima Indrajith. If you want to learn how to look slim in sarees like her then we suggest follow New saree draping styles. She looks beautiful true indian women in designer printed saree. The simple saree draping in printed saree gives her awesome look. Jacqueline Fernandez at PC Jewellers Jaipur Launch wearing a white and gold designer saree by Archana Rao. So this are latest sarees of bollywood celebrity Jacqueline Fernandez. Whenever we notice new sari wear by Jacqueline Fernandez we will update our Jacqueline Fernandez sarees collection.